Fine Mess Pottery: If You Build it Will They Come? If "it" is a website, then the answer is no, not necessarily. I get a handful of visitors to my website, only around 100 a day. I'd like to sell more stuff online, and that's going to mean getting a bunch more visitors. Which begs the question: what makes people visit a site? Lots of people visit this blog. I don't know exactly why, but I know why I read pottery blogs: to get ideas, see photos of pots and kilns, and to read about the lives and experiences of people with whom I have something in common. But I'm not shopping when I do that. I actively dislike shopping, so when I do shop I am looking for a specific thing. Coconut-lime soap, say, or John Sandford's new novel. Is that what other people do? I guess I have the impression that other people just browse around, and when they see something they really really like, they buy it. It makes a difference: if I want to sell more online, do I need to just bring more people to my website, with the expectation that more eyes means more sales, or do I need to find the people who are online specifically looking for salt and pepper shakers or dessert plates or whatever? Google Adwords seems like a way to do the latter, but I haven't had luck with it in the past. It cost me a bunch of money, but didn't result in a single sale, as far as I could tell. I'm musing about this because I have an opportunity, through the Maine Crafts Association, to purchase an ad in Downeast Magazine at a rate that I could maybe afford. Downeast, if you don't know it, is an upscale lifestyle mag topical to Maine. Lots of folks outside of Maine get it, also, and it tends to be the kinds of folks who like home furnishings and cooking and travel and who have lake homes. The sort of magazine of which issues live on for years in waiting rooms and lobbies. I'm still in the midst of my Twelve Days of Crazy, so my serious thinking about this will have to be delayed. But what do you think? Hot? Or not? Hello Lori, Love your pottery. Have you tried selling on Etsy? Setting up shop on Etsy is easy and inexpensive. You can even advertise by adding an Etsy Mini to your blog. It works for me. As to more sales, well, I've no experience with "more" sales. I've suspected as much with google ad words, it might be great for other businesses but I don't see it being helpful for a sole potter. The magazine ad might be better because of the readership of the magazine. Why not see if they'd be interested in doing an article about you also? In the recent past I have worked with a marketing consultant for an organization that I belong to (we were promoting an annual show). She advises to stay away from print ads unless you can afford to place them on a regular basis. The cost of magazine advertising is usually too expensive for an artist/craftsmen and you won't get much mileage from a one time ad. As Lori suggested, this person told us to promote ourselves to publications for human interest stories. Send press releases out whenever you have an event. Try to get your name out there for free whenever possible. Yankee Magazine in NH is also offering a special ad price for League of NH Craftsmen members this year. I agree, No, on the print ad. It takes 7-10 views before a Reader registers your ad, and that's only if it's really well written - you need to be a regular advertiser in any print media to gain customers. Go to the library and take out the newest Marketing Books (at least 3 or 4) - and READ READ READ. DO NOT REINVENT the WHEEL. There is enough good data out there, that can steer you in the right direction in those books. Marketing is an Art and a Science. Learn the science first, then you can put your own "artful" spin on what to do for your biz. I would also really take advantage of Pinterest to drive people to your website. It is a growing platform, and is free. This is a great post Thank you for writing it~ I have also tried google ads and, like you, not one sale. Done with that. I love the Down East mag, and have subscribed in the past. It's beautiful, we always buy it when we go to Maine, which is every year for vacation. I do think it could help build reputation. If you do it- definitely put your web address on it. I have had great luck with Facebook~ Shockingly...but it's a free,easy way to post photos and info. I have sold directly from a facebook posting and my step son does all his jewelery sales from Facebook. Love hearing all the other ideas too. Thanks again! 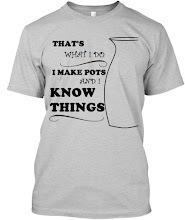 New Items in the Pottery Shop!